A Slice of Heaven in Seattle—Mother’s Day Giveaway! If you follow me on Twitter–and if you don’t good lord what are you doing with your free time?! –you know that I am a fan of Gene Juarez salons and spas. I like them because they’re fancy enough to make going there feel like a special occasion, but not so fancy you feel the frosty chill of snobbery. Last weekend I was treated to the titular slice of heaven. (btw dudes, ‘titular’ has nothing to do with boobies). I received the Be Relaxed spa package at the Redmond Gene Juarez which includes a 60-minute massage and a classic pedicure. Working full-time (in the second-most stressful job in the country! ), commuting 2 hours a day and raising 2 teenagers plus a toddler while my husband is deployed overseas makes Trixie… tense. Trixie likes massages; they are a rare and fabulous treat that I suggest all friends and family members gift me for every holiday in the future. My masseuse/massage person/savior (?) was Trish. After I was settled comfortably on the massage table she said “Let’s talk job descriptions” and I thought, oh crap she’s gonna want me to chit-chat and tell her about my job stress. But no. Next she said, “Your job is to lie there, breathe, and relax. My job is to lift you.” And she did. I don’t know what Trish’s background is or what, if any spiritual bent she has, but I know this: she is a healer. I have not been that relaxed since February 2006 (first trip to Maui). After the massage, I had a Swiss Shower which pretty much soaked in the relaxation and also conditioned the hell out of my hair. Going back into the changing room, I glanced at myself in the mirror—wet hair, not a speck of make-up –and for a moment I looked 12 years old. THAT’s how relaxed I was! I left Gene Juarez feeling relaxed, pampered and pretty. What better gift to give your mom, wife, sister, aunt, grandmother or egg donor this Mother’s Day? Receive a $15 Bonus Gift Card and exclusive offers when you purchase a gift card of $160 or more online. 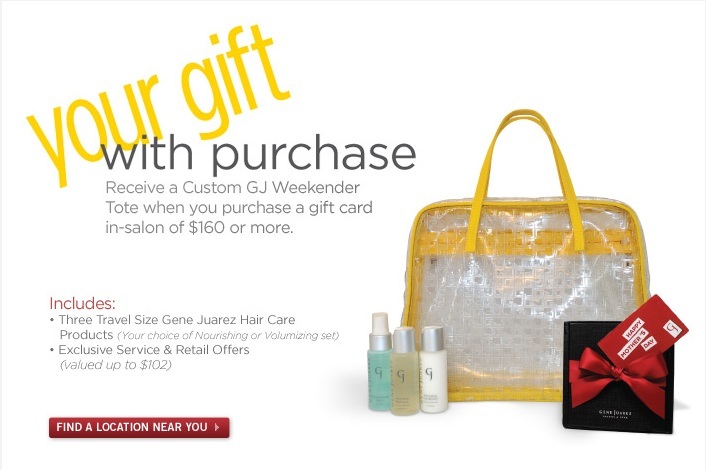 Receive a Custom GJ Weekend Tote when you purchase a gift care of $160 or more. They have also very generously donated a treat for YOU, dear reader. A gift card good for the very same Be Relaxed spa package I just told you about plus the weekender tote with great Identity1 hair products! What mom wouldn’t love to open this present on Mother’s Day? How can you acquire such a treasure? Leave a comment on this blog post and tell me why you need to relax. (And the first person who links to Frankie Goes to Hollywood is disqualified!) Please remember that Gene Juarez is a local Seattle area establishment, so if you (or your intended giftee) live in California or Hong Kong you should probably send your mom flowers instead. My wife and I agreed not to have children before marriage. About 3 years in we ended up adopting a 1.5 year boy (who happens to be our nephew) because his parents could not take care of him and had already given up his older sister for adoption (who thankfully now lives with the grandparents). Although we wouldn’t change our choice from 5 years ago, the transition has been challenging. My wife became a stay at home mom and has literally not had a moments break since 2006 (with the exception of half-day kindergarten this year). We moved to WA for my job in 2007, leaving all family and friends (I.e. potential babysitters, lol) behind. Anyway, my wife loves to be pampered (who doesn’t, really?) and I know she would be appreciative of a relaxing get away. Thanks for the consideration! My wife is married to me. End. I vote for this package to go to a single mom! Having been one before, I know that these are the moms that are often forgotten on Mother’s Day (because the ex doesn’t have it together enough to get something for her from the kids). My Mom deserves this because she is the most loving, selfless woman in the world! She recently graduated from college (at 54!) and is now trying to transition back into the work world-super stressful! !-after being an amazing stay at home for 20+ years while currently going through a divorce. My wish is that she will have an hour to truly feel loved, pampered and escape all the stress she’s under! My Mom is my best friend, and she deserves love, kindness and amazing things. A massage is just a small gesture to show her how much she truly is appreciated and how much she means to me! Why does she deserve this treat? We moved from South Africa to England in 2002. Due to the tough economic times we had there she had to work at a pub while she was expecting our second child – and worked there after our baby was born as well. She did everything to help keep food on our table and our family together. In 2006 we moved to Boston, and this proud and highly qualified mom was not allowed to work because of the type of visa I have – a H1B. I travel a lot and in 2009 we moved to Seattle (Newcastle actually) so that I don’t have to do the commute. I travel almost each week and it breaks my heart each time to leave home for another couple of days – yes, I am that dependent on her. Through all this she has been the center of our life and the one that makes us a family to love and hold dear. With each move she had to go to a new place with no friends, no family and no support system. But she never complained, always just thinking of what is best for us as a family. She does everything without any family or friends close to us. And she always thinks of me and the kids before herself – whether it is buying clothes or celebrating a special day. She always says, “I have everything I want and need”. She always laughs and smiles about how lucky we are as a family. I wish I could give her what she deserved but no amount of money or gifts in the world will ever be enough. We have love – lots of it – but a nice day just for her would be the chance for her to get a little something just for her. She is my life. And she needs a little bit of special treatment from someone else to spoil her just a little. My step-mom deserves this spa time because she’s a mother of 5, step-mother of 3, and a grandmother of 2. She works full time as a kindergarten teacher for special needs kids, and supports her whole family on that salary. This lady is not only the hardest worker I know, but the sweetest and most generous person I know. I should write here why I need this spa day. My job was super stressful, traveling 4 weeks out of 5. Having my Mother fall fatally ill while on a business trip, which meant I had to go say goodbye. When I got home from saying goodbye I lost my job. Then my Step-mom was hospitalized and eventually had major abdominal surgery last week. Also, I’m getting married in 8 days. But! I would actually like to put forth my Step-Mom as the one who should win. She deserves it more than me. Thanks for being a model girl gamer for us all.